I usually "preroll" the cloth into the channel. 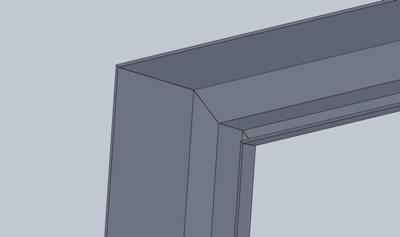 But you need to have the right spline that was designed to work with your extrusion. Polyfoam spline is the easiest to work with. Vinyl and EPDM spline have to be exactly the right size or you will have difficulties. I own a house which has a recessed entrance that I would like to enclose. Where can I buy aluminum material (not the doors) to frame this in? Then I want to fill in beside and above the doors with glass. so I can quote the cost of materials. If this opening is tall or wide you may need glass as well. I have screen frames filled with a see thru vinyl plastic instead of screen to close the room up from the outside elements. The plastic is old and brittle. Where can I find the replacement plastic to reline the frames? Locate a business nearby that sells materials for the sign industry. Ask for 4 x 8 sheets of Acrylite in the same thickness that you have now. Probably 1/8". Some shops will cut to size for you but its easy to cut with a skilsaw and a straightedge. I have a triangle-shaped area I need to rescreen. Do you have any tips you could share on the subject so the screen is pulled tight and there are no wrinkles in it when I am through? Regardless of the shape, the most important thing is to keep the screen material flat by using spring clamps and clamping the screen frame and cloth to a work table. Dont stretch the material just clamp it flat and you can roll it into hexagon, circular and triangular shaped frames without problem. Also use the right size spline. Too tight and it will bunch up the cloth, too lose and it will just come out to easily. I have an existing aluminum screen enclosure around my pool. There is one door leading to my side yard, but I would like a door that goes directly into my back yard. How would I go about installing a door in the existing screen? I am somewhat handy. Should I call someone? Also, there are diagonal cables on the exterior of the screen at the corners that run from the top corners to the ground. Would the new door not be able to go where those cables are? I assume they are some type of support system. Thanks for any information. If you need any more information from me just let me know. Thanks. It's difficult to give a proper answer without seeing some digital pictures but in general the installation of a screened door should not be that difficult. You first need to create a rigid enough frame to hold to hold the door which is anchored to the floor and ceiling. You might even be able to match the new frame to your existing screen enclosure. Tampa, FL 33605 is a large supplier of screen enclosure bars in Florida. I have these little plastic butterflies which can be used to cover holes in the screens. You just snap the two halves together over the hole to cover it up. You could also get a small square of screening cloth and spray it with aerosol adhesive from the hardware store, then stick it over the hole. Attached is a photograph of my first attempt at screening in my back patio. I was wondering if you might have any thoughts, tips, advice, etc. about my project? The area that I'm trying to screen (as shown) is 96"H x 98"W. I was told by the staff at my local home improvement store that my screening project would be very challenging but possible. I have since had difficulty getting much words of wisdom so I've been doing some internet searching but have come up short. The issue is: my wife would really prefer not to install a cross bar (at any height) or a kick plate across the width of the area. I am hoping that I will be able to complete the task at hand without doing so. Any thoughts on how to go about making the job easier, more efficient, less sloppy? First of all, sorry for the delay in responding. The cleanest neatest way of screening this opening would be a custom width retractable screens mounted on the wall on the right of the picture and spanning the entire opening. My rough guess would be at a cost of around $600.00. The next best way would be to build 2 frames, side by side, 47" wide x 98" tall out of white aluminum bar. Cost for those including an "astragal" to join them together and cloth would be about $200.00. You could also have 1 very large frame, full size but this would be a little more awkward to screen because you would have to do it on site. The 2 screens make it less expensive to repair if the screens ever get ripped. You could build a simple wood frame or cleats to screw the frames onto. The wood frame would be attached to the concrete with tapcon concrete screws or similar fasteners. 1" x 2" framing would be inexpensive and would do fine. To attach the frames you would simply screw them into the wooden cleats. At the storm door, the right hand jamb might overlap the frame, allowing you to put screws right through. If not you might need to add a wooden cleat to join the screens to the door jamb. Would be happy to help with any frames you need. I will have a concrete porch with 6x6 wooden posts covered with vinyl column covers. I would like to be able to screen the porch without having any wood in contact with the concrete. Will any of your aluminum products work for this? If so, how? I have a screening bar with a right angled lip on it. You can build a rectangular frame usually 4 feet wide x 7 feet high and screw the the bottom lip right into the concrete with tapcon fasteners. The top lip can be screwed right into the soffit or capping. On the right and left the lip can be screwed directly to the columns. 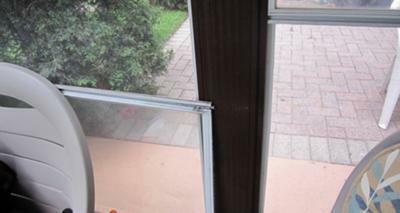 I have an old sunroom with rollup windows whihc have lead stoppers to keep the window open at various positions. Most of the lead stoppers have broken after years of use. I found some replacement parts, the packing had label of "Ideal Security SK3EP". I can't find any more. I need about 12 of them. I have enclosed a picture of the lead stopper (3 parts) and the window. These are called panel clips and yes I have them. The panel clip in the photo looks the same as mine but call me at 1-866-904-2383 to be sure. 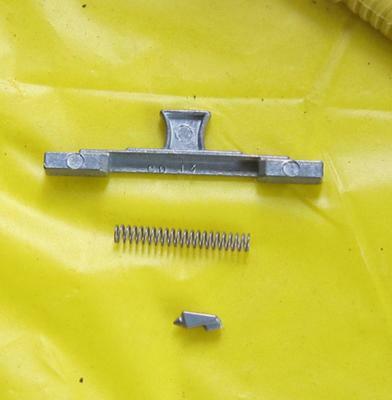 There are lots of different sizes of panel clips. Built a beautiful attached screened-in porch, 4x4 posts, and sawed down 1.25" treated flooring for the screen rails. Routered a spline track around the perimeter and installed the screen with spline. The rails were screwed to the inside of the 4x4 posts and have worked for over 10 years. Did replace a few screens last year from bird damage, etc. The wood is getting old and the screws were hard to remove, some broke. Would like to replace with the screen bar system but can't locate any in Chicagoland area using Google search. Any help would be appreciated. I can arrange to have screen bars shipped directly to you if that helps, just contact me at 1-866-904-2383. Our rabbit chewed a hole in the bottom of one of our porch screens...now I am trying to figure out who to call to fix it? large rectangular frame...there are 7 screen windows and 1 screened door...so the hole is just in the bottom of one of the screened frames. do I go to home depot? how do I order the new frame...we bought the house after the screen porch was in and no way to find out who originally put the screen porch in the house. Home Depot or Lowes dont usually carry the right materials for repairing screened porches. Try locating a local glass shop that has experience building screened porches. 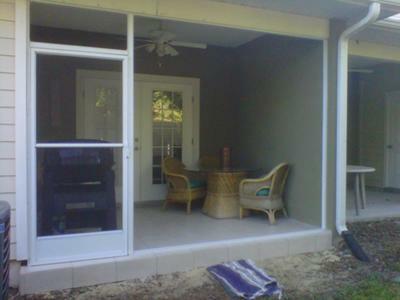 If you porch is aluminum, then it should be a simple matter of pulling out the frames and getting them rescreened. If the porch is wood, and the screening is stapled in place its a bit more time consuming because all the old cloth has to be torn down and new material stapled up. The best way to repair old wooden porches is to have aluminum frames made to fit in the openings. This makes it a whole lot easier, and cheaper to have them repaired in the future.